Her description of the preparations and activity of this auction are gripping and page turning, but it is at the end of this chapter that the story of this watch takes the reader on a ride through history, back in time to a previous century when the competition really began. Ms. Perman shares her detailed research through the lives of Ward Packard and Henry Graves, Jr. in the late 19th and early 20th centuries. These men meet in the world of horology as each is introduced to timepieces of vast value. As their knowledge of expensive timepieces grows their preoccupation with owning the Supercomplication becomes an obsession. These were men raised in wealth; each blazed his own trail to further secure his social standing. Each man’s family and upbringing can be described in one word: opulence. Ms. Perman alternates her biographies, explaining in several chapters Ward Packard’s mechanical acumen from the success of his Packard Electric Company to the design and development of the Packard automobile, and then turning to Henry Graves, Jr., and his life in the world of philanthropy, art, and all things beautiful. Detailed histories of these competitors—the biographical information of each man’s family prior to their births, and then the details of their lives as each finds his own path to success—often seem to eclipse the story of the watches which take second place to the details of their lives. There seems to be more time spent on the Packard automobile and the philanthropic and art collection activities than on the watches. Yet this minute detail is important to understanding Packard and Graves and what drove them in their daily lives. Ms. Perman intertwines the relationship each man develops with various watches with the intricate stories of their lives, cleverly inserting references to the many watches each possessed. Again and again we delve into the minutiae of each man’s life and are brought back to the story of the watch of all watches. As the story progresses, the competition between Ward and Graves escalates. Yet only one man can take the prize. As the story winds down—pun intended—Ms. Perman brings the reader back to the New York auction scene, this time to Christie’s in 2010 where the Packard collection goes on the block, long after both men have died. Again we are gripped by the scene of a fierce bidding war for a number of lots. When the dust settles, a sum of over three million dollars has passed through the auction house for the purchase of one single timepiece! 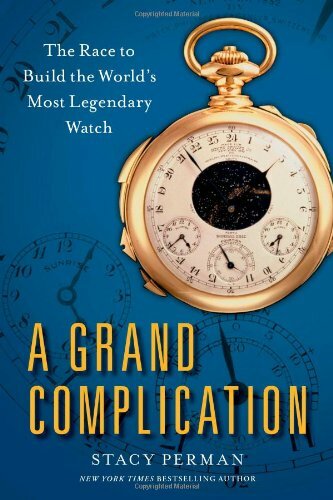 A Grand Complication is an interesting walk through an historic time in America as seen through the eyes of wealth and obsession. Anyone who owns a pocket watch handed down through generations should read this book and take a close look at the history behind their family heirloom.